This frosting recipe is a cooked meringue (no Salmonella here thanks!). There are three techniques to making meringue (French/Swiss/Italian), and each can be used to create the perfect meringue for its purpose. French Meringue – is an uncooked meringue, and the least stable of the three. Granular sugar is gradually added to the soft-peak-beaten egg whites, the result is a smooth, fluffy and light meringue, which is perfect for soufflés and pie toppings. Swiss Meringue – is made by whipping sugar and egg whites vigorously over a pot of simmering water (the sugar and egg whites should be very warm to the touch before whipping them). This method creates a more dense, firm and fine texture, perfect for baking crisp meringues. Italian Meringue – this is made with a sugar syrup that has been heated to the soft-ball stage (112°C). 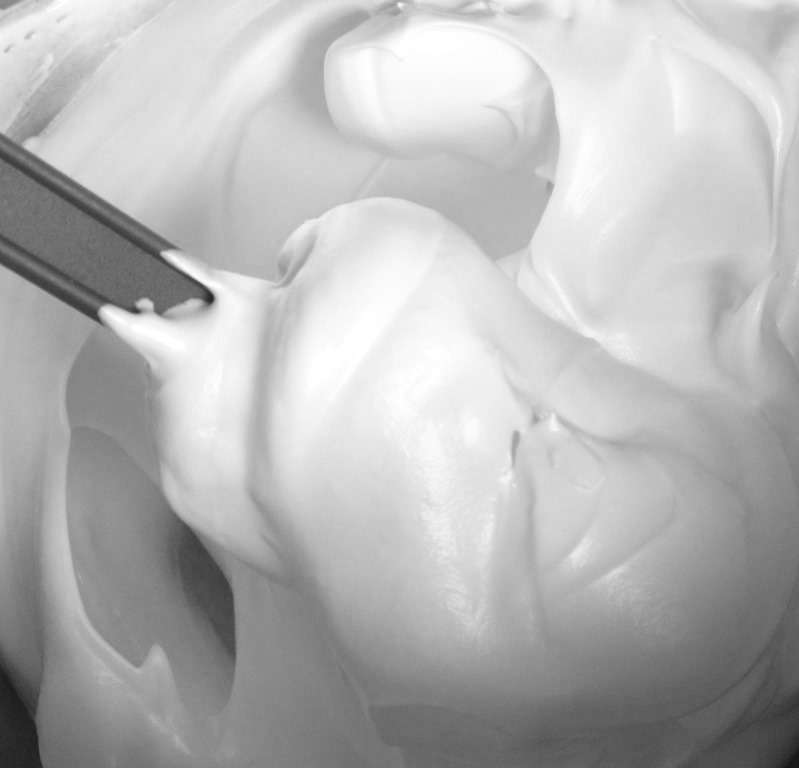 The syrup is poured slowly into soft-peak-beaten egg whites to create voluminous, firm and glossy peaks. It is the most stable of meringues and makes great icings and mousses. Place the sugar and water in a heavy based pan. Slowly bring the mixture to the boil and simmer for 8 minutes, or until reaching “soft ball” stage. If you are using a sugar thermometer this will be at a temperature of 112°C. Beat the egg whites until foamy, remove the sugar syrup from the heat and pour the syrup in a thin consistent stream over the beaten egg whites while beating. Continue beating the mixture until the icing is thick and glossy. Get ready to ice/ pipe this as a topping to cupcakes, baked Alaska or meringue pie. 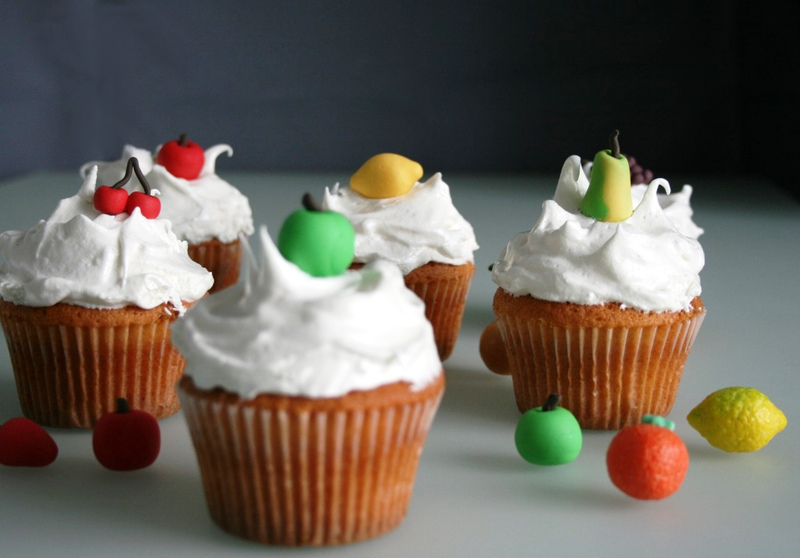 We topped our meringue iced cupcakes with Nicoletta marzipan fruits and fondant fruits (made using Ready to Roll Fondant). Check out our tips and tricks to making the perfect meringues. Here is a handy guide to heating sugar, whether you use a thermometer or the droplet method. Characteristics of Sugar syrup dropped into a glass of cool water – Thread stage 102 Forms a liquid thread that will not ball up. Soft Ball stage 112 Forms a soft, flexible ball. Firm ball stage 118 Forms a firm ball. Hard ball stage 121 Forms thick, “ropy” threads as it drips from the spoon, forms a hard ball in water. Soft crack stage 129 Forms solid threads that, when removed from the water, are flexible, not brittle. Hard crack stage 143 Forms hard, brittle threads that break when bent Clear liquid 160 At this temperature all the water has boiled away. The remaining sugar is liquid and light amber in colour. Brown liquid 170 At this stage the liquefied sugar turns brown in colour due to caramelisation Burnt sugar 176 The sugar begins to burn and develops a bitter, burnt taste. Soggy, discoloured, collapsed, grainy, sweating meringue? We address some worries and let you in on some secret weapons for dealing with meringues. Meringue (egg white and sugar) is a fussy animal. Creating a stable, fluffy, glossy and white meringue is all about incorporating air and keeping the bubbles intact.As egg proteins denature during the whipping/ heating process, and form a protective film around the incorporated air bubbles. Certain techniques and ingredients can work to destabilise the protective film/ enhance the formation of a stable texture. Here are 14 tips to make the perfect, no-flop meringues. One of the most important rules of meringue making is that all of your equipment must be squeaky clean, without any water or oil present. (Metal or glass mixing bowls are best for yielding voluminous beaten egg whites as plastic can retain fat and grease.) Cream of tartar/vinegar/ lemon juice – work to stabilise egg whites, increasing their heat tolerance and volume; as well as prevent sugar syrups from crystallising; they also help the meringue to be white & crisp but remain fluffy and sticky on the inside. Use an automatic mixer, unless you want to do it by hand (in which case you will have 1 arm of steel, and your new nickname will be “the claw”). Use caster sugar as the small grains dissolve easily in the foamy mixture. Add the sugar in a painfully slow manner – tablespoon by tablespoon at the soft-peak stage. (When you have added all the sugar, spoon a little meringue onto your finger and rub to feel any undissolved sugar crystals). Undissolved sugar will weigh down the meringue and attract moisture to form beading, the formation of water droplets on the surface. Do not make meringues that have less than 2 tablespoons of sugar per egg white. If you use any less, the foam will not set and the meringue will shrink. Soft, chewy meringues are usually made with equal parts sugar and egg white, while hard meringues uses 2 parts sugar for every egg white. Cold eggs separate easily, but eggs whip to a higher volume when at room temperature. The solution is to separate the cold eggs, and then set them aside for 10 or 15 minutes. Be careful not to drop any yolk into your whites. If you lose any bits of shell, scoop them out with a clean spoon rather than your fingers. Even a small amount of yolk can deflate the egg whites, so be careful. Don’t under-whip as the meringue will weep and become soggy, similarly, don’t over-whip as the meringue will collapse. Soft peaks are fine for a pie topping, but for a dessert base such as a pavlova, you need stiff, glossy peaks. Wedge open the oven door during cooking to develop crisp dry meringues and prevent overheating; use a low temperature and long baking time. Allow the meringues to remain in the oven after baking. This helps dry them out. Try and avoid making meringues on a humid day. The sugar in the meringue attracts moisture and makes it chewy. It may take longer for the meringue to bake and dry out in the oven. Don’t undercook your meringue as it may weep (water-loss), similarly, don’t overcook your meringue as this causes syrup beading. Meringues are finished baking when they are crisp on the outside, and sound hollow when tapped on the bottom. Once ready to bake, add other ingredients. Fold through cocoa/spices /flavourings, or roll the meringues in nuts/ sprinkles. In light of current research on gluten and its effects on the body (outside of the coeliac aversion to gluten), we have put together some information on gluten-reduced baking techniques. Gluten is a protein found in wheat, rye, barley, triticale (cross between wheat and rye), kamut and spelt (ancient forms of wheat). Oats are usually put in this category because they may contain cross contamination with wheat. The gluten protein is responsible for the glue-like elasticity that is present in batters and doughs. Why are people choosing to avoid gluten? People suffering from wheat allergies, coeliac disease, gluten intolerance / sensitivity are affected by the protein in a way that stimulates an allergic response, causing uncomfortable symptoms and reduced optimal health. Wheat allergy – is one of the rarer common food allergies, whose symptoms include exercise / aspirin induced anaphylaxis as well as skin rashes. Coeliac disease – is a genetic autoimmune disease that creates inflammation throughout the body, and progressively destroys the nutrient-absorbing villi in your small intestine. Gluten exacerbates this response in coeliac patients. This chronic digestive disorder leads to the malabsorption of minerals and nutrients. 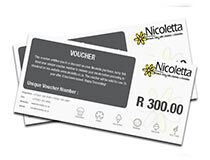 Coeliac disease has wide-ranging effects across all organs and joints. Gluten intolerance/ sensitivity – is reactivity to consuming gluten. Although it poses less severe symptoms when compared to coeliac disease; these symptoms include bloating, abdominal discomfort or pain, diarrhoea, muscular disturbances and bone or joint pain. “Gluten sensitivity” represents a completely different condition from coeliac disease, and most of the people who suffer from gluten sensitivity will never develop coeliac. Research into gluten sensitivity is evolving rapidly and the differences between these two conditions stems from differing immune system responses. It has been noted that gluten is not only responsible for allergic reactions, but has been known to “provoke” a number of diseases (according to a review paper in The New England Journal of Medicine), such as osteoporosis, irritable bowel disease, inflammatory bowel disease, anaemia, cancer, fatigue, canker sores, rheumatoid arthritis, lupus, multiple sclerosis, and almost all other autoimmune diseases. Gluten has also been linked to many psychiatric and neurological diseases, including anxiety, depression, schizophrenia, dementia, migraines, epilepsy, and neuropathy (nerve damage). It has also been linked to autism. Gluten free grains include rice, maize/corn (polenta /maizina), quinoa, millet, buckwheat, oats, and sorghum. 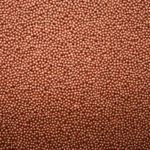 These grains can be made into flour and are useful to replace gluten flour in baking. Many people who struggle to process wheat find that spelt is acceptable. Also, there is trend toward using almond meal/ nut flours and coconut flours as well as bean/ legume flours in baking (as grain alternatives). Often the final baked product (when using gluten free flour) may have a denser texture due to the reduced presence of elastic proteins that stretch to allow aeration of the baked goods. The texture may be gummier and the mixture may require more cooking time/ added moisture and fibre. Gluten free baking seems to be about trial and error – whether the chosen flour is right for your recipe – one will have to find out? If baking with gluten free flours (rather than altering a current recipe), look for gluten-free recipe alternatives (at least these recipes have been tried and tested)! 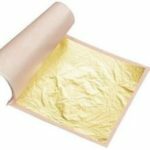 There are also recipes for Gluten-Free Flour blends that can be found online, this blend can be used to substitute gluten flour in a favourite recipe. Alternatively look out for gluten free pancake or muffin mixes, and then use these as a flour substitute, since they have already been blended to give a good baked texture. Once your gluten-free goodies are baked, try our range of Non-Wheat/ Non-Gluten cake decorations (Ready to Roll Fondant, Cake Confetti, and Cake Crystals, Stationery for Cakes, Heavenly Hearts, Chocolate Popping Candy, Chocolate Hearts and Buttons, Shimmer, Writing icing, Soft centred pearls, Soft silver “bling” balls). 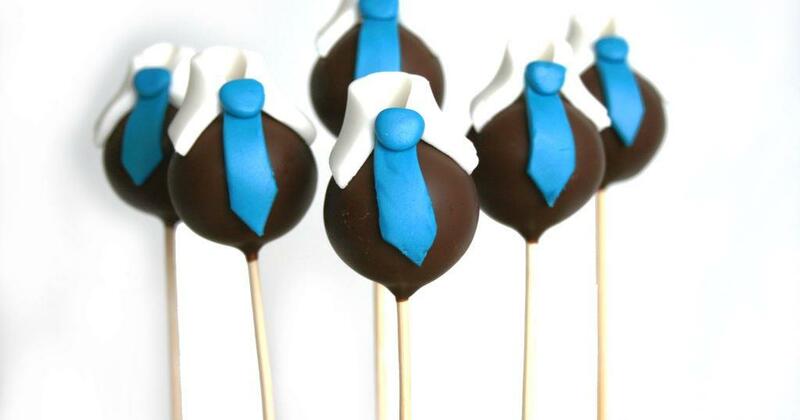 With Father’s Day around the corner, we thought we would craft a few cake pops inspired by our Dads. The first batch was too wet and didn’t form balls properly, so we discarded it – what a waste of good cake and icing. The second batch was delicious but messy and had tempers flaring in frustration. Then, we had our experienced friend Yolandi Heyneke of Love Life Cupcakes (a cake pop baking whizz) show us how to make cake pops the fool-proof way. Yolandi made some awesome suit & tie cake pops, moustache shaped cake pops and original chocolate cake pops dipped in white or milk chocolate. Use any type of cake (even shop bought sponge) and cream cheese instead of frosting. It makes them smoother! Crumble the cake with a grater or food processor. The amount of cream cheese to add is not an exact science, Yolandi knows it’s right when the consistency is the same as play dough. 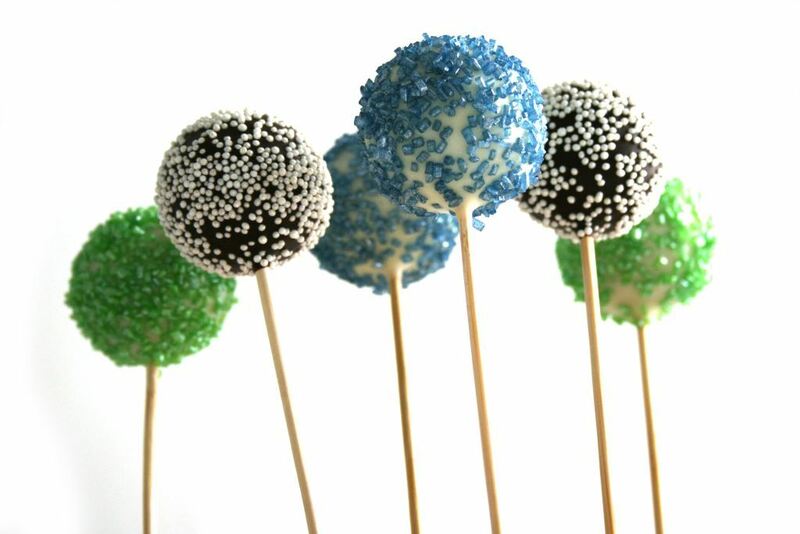 For the professional touch – weigh the balls of mixture to make perfectly sized pops (perfect size is 25 – 27g). The balls are then cooled (not frozen) – just pop them in the freezer (for 15min) or fridge (for 1 – 2 hrs) to firm up. If they are frozen, the dipped chocolate will crack once they start defrosting. When melting the chocolate in the microwave keep the microwave on low/defrost (or melt chocolate in a double-boiler to prevent burning). Stir the chocolate frequently to prevent overheating. The chocolate should be melted but not hot. Add a few pieces of extra un-melted chocolate if it’s too hot in order to cool it down. When the balls are firm and you have your chocolate ready, dip the tip of the Cake Pop Stick in the chocolate and insert it into the balls. Dip the balls in chocolate; they should be completely covered, and then roll the stick around in your hand to let the excess chocolate drip back into the bowl. You will note when it starts to firm up and you can then push the stick into a polystyrene block or empty egg box to dry completely. 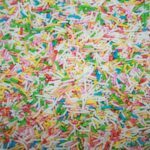 When using sprinkles, let the excess chocolate drip off and just before putting them in the polystyrene block, sprinkle the balls. (Don’t let any sprinkles fall into your choc dipping bowl). We used our Blue and Green Nicoletta Cake Crystals as well as Nicoletta Pearl Drops and Blue & White Ready to Roll Fondant to make the shirts and ties. Once you get the hang of doing the balls, you can also make different shapes by using cookie cutters or moulds. 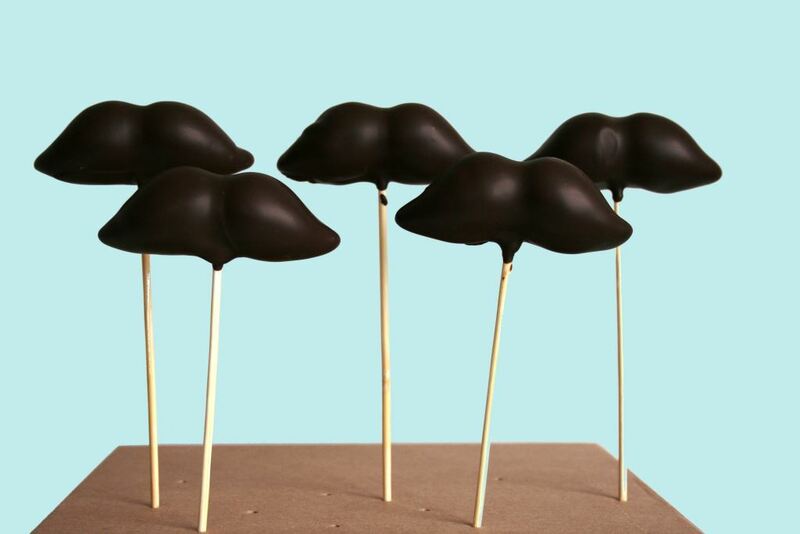 These moustache cake pops are fun, not fuzzy! Cake Pops require patience and practice. Have fun and don’t take yourself too seriously. Your dad will appreciate the taste more than the look anyway! Although the thought of vegan baking can boggle the mind, there are many recipes have been designed to avoid the use of eggs, butter, milk and other animal derived ingredients. Eggs are used as a binding agent, to keep in moisture, and give texture. Use ¼ cup of soya yogurt/ mashed banana (note: leaves a banana flavour)/ apple sauce, or alternatively 1 Tbs. ground flaxseed in 3 Tbs. water, to replace one egg. Exchanges can be made from cow’s milk to soya milk, coconut milk, rice milk, and almond/hazelnut milk. In place of buttermilk use 1 tsp. apple cider vinegar to curdle 1 cup of soya milk. Oils and fats are used to bind, and add moisture and flavour to baked goods. Vegetable oils/ vegetarian margarine/ coconut oil can replace butter. In place of honey as a sweetener, try maple syrup, agave nectar/ golden syrup. Avoid colourings or decorations that contain cochineal or shellac (insect derived ingredients). This list below contains our retail range of packaged products that are suitable for Vegans (as seen on the header).